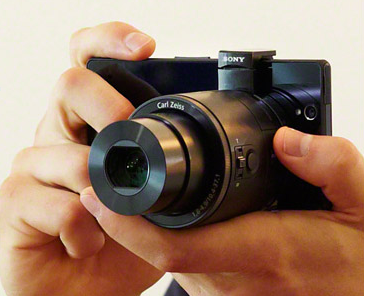 Turn your smartphone into a zoom camera with Sony’s Smartphone Attachable Lens-Style Camera. Clip on easily to your iPhone/Android phone, and share pics instantly online over wifi. You can even hold your phone in one hand and take pics on it with the other. Shoot with 10x optical zoom with the DSC-QX10/B model, or for professional DSLR-quality pics, opt for the DSC-QX100/B model.